J. Chem. Phys, 149, 214304 (2018). Eur. Phys. J. D 72: 225 (2018). J. Phys. Chem. Lett. 9, 1931 (2018). PDF. Mol. Phys. 116, 1635 (2018). Chem. Phys. Lett. 689, 62 (2017). Chem. Phys. Lett. 685, 427 (2017). Mol. Phys. 115, 2658 (2017). J. Phys. Chem. A 120 (42) 8254 (2016). J. Phys. Chem. A 119, 11432 (2015). J. Phys. Chem. A, 119, 12512 (2015). J. Chem. Phys. 143, 114304 (2015). J. Chem. Phys. 142, 174311 (2015). J. Phys. Chem. Lett. 6, 633 (2015). PDF. Astrophysical Journal Supplement Series 217, 20 (2015). J. Chem. Phys. 141, 064306 (2014). J. Phys. Chem. A 118, 5915 (2014). International Reviews in Physical Chemistry 33, 371 (2014). J. Chem. Phys. 140, 244315 (2014). J. Phys. Chem. A 118, 6416 (2014). International Reviews in Physical Chemistry 33, 125 (2014). Correction to “state-to-state quantum-mechanical calculations of rate coefficients for the D++ H2 reaction at low temperature"
J. Phys. Chem. A 117, 13205 (2013). J. Chem. Phys. 139, 054301 (2013). J. Phys. Chem. A 117, 9778 (2013). J. Chem. Phys. 138, 094318 (2013). J. Phys. Chem. A 117, 1872 (2013). Astron. Astrophys. 551, A38 (2013). J. Chem. Phys. 137, 154303 (2012). Phil. Trans. R. Soc. A, 370, 5200 (2012). Phys. Rev. Lett. 108, 109903 (2012). Computational and Theoretical Chemistry 990, 39 (2012). J. Chem. Phys. 136, 164309 (2012). Astrophysical Journal Supplement Series 199, 21 (2012). Science 334, 1538 (2011). Link1. Link2. Phys. Chem. Chem. Phys. 13, 19089 (2011). J. Chem. Phys. 135, 114308 (2011). 71) N. Bulut, O. Roncero, M. Jorfi, P. Honvault. J. Chem. Phys 135, 104307 (2011). J. Phys. Chem. A 115, 8791 (2011). Phys. Rev. Lett. 107, 023201 (2011). Phys. Chem. Chem. Phys. 13, 8414 (2011). Oxygen depletion in dense molecular clouds: a clue to low O2 abundance? Astron. & Astrophys. 530, A61 (2011). Mol. Phys. 109, 543 (2011) . J. Chem. Phys. 133, 144315 (2010). J. Phys. Chem. A 114, 7494 (2010). J. Chem. Phys.132, 104306 (2010). Mol. Phys. 108, 373 (2010). J. Phys. Chem. A 114, 4742 (2010). J. Chem. Phys., Communication 131, 221104 (2009).PDF. On themain page of JCP. 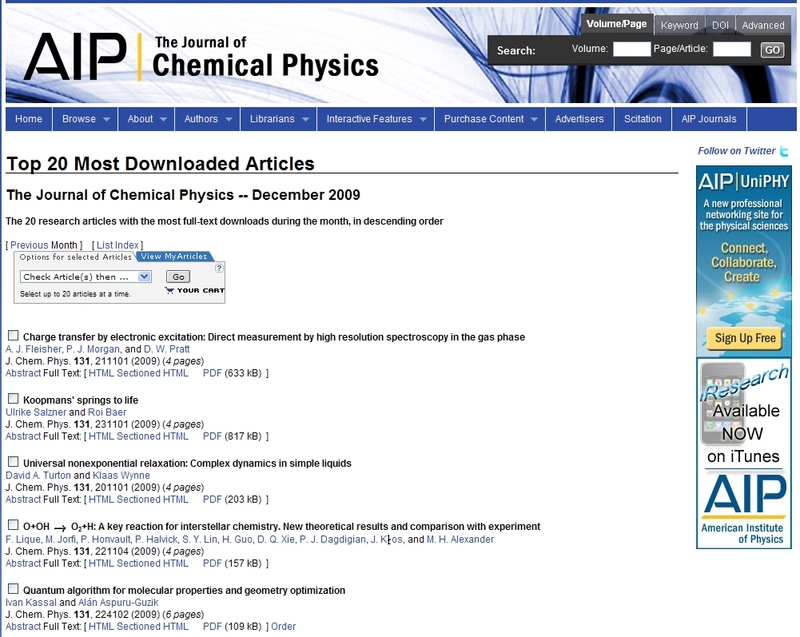 Top 20 most downloaded articles. J. Phys. Chem. A 113, 10648 (2009). J. Chem. Phys. 131, 114303 (2009). J. Chem. Phys. 131, 094302 (2009). J. Chem. Phys. 131, 044315 (2009). J. Chem. Phys. 130, 184301 (2009). Phys. Chem. Chem. Phys. 11, 6182 (2009). J. Chem. Phys. 130, 194303 (2009). Chem. Phys. Lett. 471, 65 (2009). J. Phys. Chem. A 113, 2316 (2009). Eur. Phys. J. D 49, 75 (2008). Chem. Phys. Lett. 462, 53 (2008). J. Chem. Phys. 128, 204301 (2008). Chem. Phys. Lett. 453, 140 (2008). Chem. Phys. Lett. 456, 7 (2008). J. Phys. Chem. A 112, 602 (2008). Astrophys. J., 681(2), 1318 (2008). J. Chem. Phys, 128, 014304 (2008). J. Chem. Phys, 128, 014303 (2008). Molecules in Space & Laboratory conference proceedings, Paris, May 14-18, 2007, Editors: J.L. Lemaire, F. Combes. Publisher: S. Diana., p.118 (2007), PDF. J. Chem. Phys, 127, 074302 (2007). J. Chem. Phys, 127, 024304 (2007). J. Phys. Chem. A, 111, 5349 (2007).Letter. Phys. Rev. A75, 050701(R) (2007). Rapid Communication. J. Chem. Phys. 126, 184308 (2007). J. Phys. Chem. B, 110, 23641 (2006).Letter. J. Phys. Chem. A 110, 12017 (2006). J. Chem. Phys. 125, 094314 (2006). J. Chem. Phys. 124, 154314 (2006). J. Phys. Chem. A 110, 817 (2006). Phys. Rev. Lett. 94, 200402 (2005). Phys. Chem. Chem. Phys. 7, 1476 (2005). Phys. Rev. A 71, 032722 (2005). Phys. Rev. Lett. 94, 033201 (2005). Phys. Chem. Chem. Phys. 7, 627 (2005). Eur. Phys. J. D 30, 201 (2004). Phys. Chem. Chem. Phys. 6, 4957 (2004). (Hot paper, 27 october 2004). Kluwer Academic Publishers, ISBN: 978-1402020551, 187-215 (2004). Review article. J. Phys. Chem. A 108, 1616 (2004). Chem. Phys. Lett. 370, 371 (2003). J. Chem. Phys. 118, 565 (2003). J. Chem. Phys. 117, 10109 (2002). 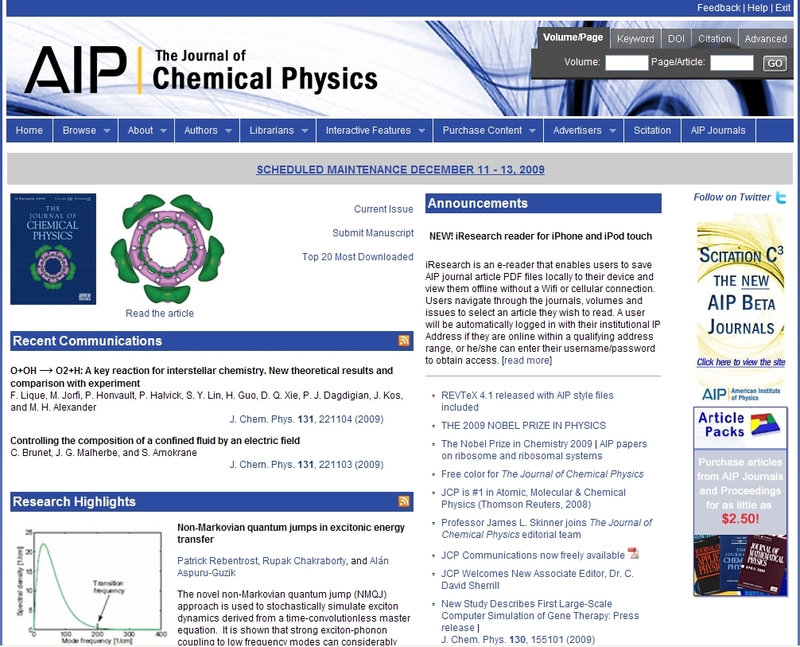 Proceedings of the CCP6 workshop on "Interactions of Cold Atoms and Molecules", 20 (2002). Phys. Rev. Lett. 89, 153201 (2002). Phys. Rev. Lett. 89, 013201 (2002). J. Chem. Phys. 116, 10692 (2002). J. Chem. Phys. 115, 10701 (2001). Phys. Rev. Lett. 86, 1729 (2001). J. Chem. Phys. 114, 1057 (2001). Communication. Chem. Phys. Lett. 329, 233 (2000). in "New Trends in Quantum Systems in Chemistry and Physics"
Volume 2, p. 133-142, Kluwer Academic Publishers (2000). J. Chem. Phys. 111, 6665 (1999). Communication. Phys. Chem. Chem. Phys. 1, 3415 (1999). Chem. Phys. Lett. 303, 657 (1999). Chem. Phys. 238, 401 (1998). J. Chem. Phys. 108, 10319 (1998). Chem. Phys. Lett. 287, 270 (1998). Mol. Phys. 91, 223 (1997). Astron. Astrophys. 302, 931 (1995). J. Phys. B At. Mol. Opt. Phys. 27, 3115 (1994).